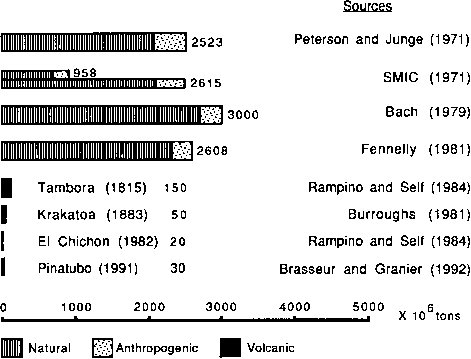 Note: The volcanic contributions appear small. Their major impact is produced by their ability to make a rapid and intense contribution to the aerosol content of the atmosphere. rainforests must make a significant contribution to turbidity. Some authorities would also include soil erosion—created by inefficient or destructive agricultural practices—among anthropogenic sources of aerosols (Lockwood 1979). Anthropogenically generated particulate matter tends to remain closer to the earth's surface than the natural variety, as is readily apparent in most large urban areas. One of the few exceptions is the direct injection of soot particles into the stratosphere by high-flying commercial aircraft. The annual production of elemental carbon from that source is estimated at 16,000 tonnes, of which 10 per cent is added directly to the stratosphere. With the introduction of a new generation of supersonic aircraft—which would spend a greater proportion of their flight time in the stratosphere—stratospheric soot loading would probably double (Pueschel et al. 1992). Various attempts have been made to estimate the impact of human activities on background levels of atmospheric turbidity. One approach to this is to examine turbidity levels in locations such as the high Alps and the Caucasus (renowned for their clean air) or mid-ocean and polar locations (far removed from the common sources of aerosols). These are seen as reference points from which trends can be established. As it stands, the evidence is remarkably contradictory. atmosphere in the Sinai, measurements indicate a 10 per cent reduction in direct beam solar energy up to the mid-1970s, in an area far removed from major industrial sources (Lockwood 1979). The fine particle content of the air above the North Atlantic doubled between 1907 and 1969, and at Mauna Loa in Hawaii, one estimate suggests an increase in turbidity of 30 per cent in the ten years between 1957 and 1967 (Bryson 1968). That period included the Mount Agung eruption, but the increase was still apparent after the effects of the volcanic emissions had been removed from the calculations (Bryson and Peterson 1968). On the assumption that natural background levels of atmospheric turbidity should remain constant, or fluctuate within a very narrow range, these rising aerosol levels were ascribed to human activities. The development of the Arctic Haze in recent years is generally considered to be an indication of continuing anthropogenic aerosol loading of the atmosphere. The haze is not of local origin. It is created in mid-latitudes as atmospheric pollution, which is subsequently carried polewards to settle over the Arctic. It is most pronounced between December and March, for several reasons, including the increased emission of pollutants at that season, the more rapid and efficient poleward transport in winter and the longer residence time of haze particles in the highly stable Arctic air at that time of year (Shaw 1980). Vertical profiles through the air mass show that the bulk of the aerosols are concentrated in the lowest 2 km of the atmosphere (see Figure 5.9). Arctic air pollution has increased since the mid-1950s in parallel with increased aerosol emissions in Europe, and the net result has been a measurable reduction in visibility and perturbation of the regional radiation budget (Barrie 1986). Note: C(H)/C(0) is the concentration at a specific altitude divided by the concentration at the surface. Arctic Haze includes a variety of components—from dust and soot particles to pesticides—but the most common constituent is sulphate particles. 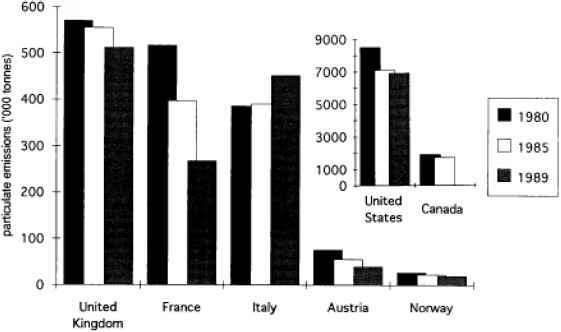 Their presence at increasingly high concentrations not only in the Arctic, but in other remote areas, such as the republic of Georgia in the former Soviet Union, far removed from major pollution sources, is also causing concern (Shaw 1987), because of their ability to disrupt the flow of energy in the atmosphere and because of the contribution they make to acid precipitation (see Chapter 4). 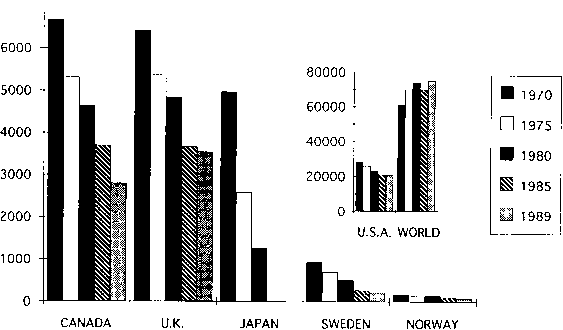 (1968) claimed to find evidence of rising levels of turbidity induced by human activities, were re-interpreted to show that there was no evidence that human activity affected atmospheric turbidity on a global scale (Ellis and Pueschel 1971). The short term fluctuations revealed in the data were associated with naturally produced aerosols. The contradictory results from Mauna Loa reflect differences in the scientific interpretation of the data from one observatory. Differences between stations are the result of a combination of physical and human factors, and, in reality, are only to be expected. 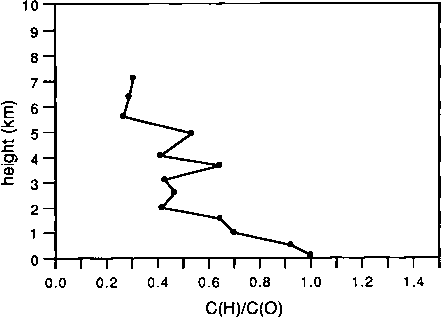 Emission sites are unevenly distributed. Most are located in mid-latitudes in the northern hemisphere, and there are great gaps—over the oceans, for example— where little human activity takes place. The atmospheric circulation helps to spread the pollutants, but, since the bulk of the emissions from anthropogenic sources are confined to the lower troposphere, their residence time in the atmosphere is relatively short. Their eventual distribution is therefore less widespread than volcanic emissions—which are concentrated in the upper troposphere and stratosphere. Aerosols produced in the industrial areas of the northeastern United States have almost entirely dropped out of the westerly air-stream before it reaches Europe, but aerosols from European sources spread over most of North Africa in January, and may drift out over the Atlantic also, depending upon the strength of the continental high pressure system (Lockwood 1979). Such patterns may help to explain the rising turbidity levels in the Alps and the Caucasus, and even in the Sinai. In the southern hemisphere, the particulate contribution from industrial activity is negligible, and there is only limited cross-equatorial flow from the north. Aerosols produced during the burning of tropical forests and grasslands will offset the reduction in industrial aerosols (Bach 1976), but the proportion of aerosols of direct anthropogenic origin is usually considered to be much less than in the northern hemisphere. The absence of anthropogenic aerosol sources may explain the lack of change in turbidity over the Antarctic, but the presence of high pressure at the surface and the strong westerlies of the circumpolar vortex aloft may combine to prevent the transport of aerosols into the area. This is certainly the case with natural aerosols. Particulate matter from Pinatubo and Mount Hudson was unable to penetrate the Antarctic circumpolar vortex during the first winter following its emission (Deshler et al. 1992). The exact contribution of anthropogenic sources of aerosols to atmospheric turbidity is difficult to determine, and is likely to remain so until the number of measuring sites is increased and their current uneven distribution is improved. This is common knowledge that disaster is everywhere. 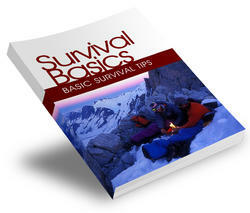 Its in the streets, its inside your campuses, and it can even be found inside your home. The question is not whether we are safe because no one is really THAT secure anymore but whether we can do something to lessen the odds of ever becoming a victim. Do high aerosol readings contribute to a turbid atmosphere?